A festival on a ski slope! The Echigo Yuzawa Onsen Snow Festival is held on a local ski slope just as the ski season is coming to an end and boasts a beautiful fireworks display over snow for a heated celebration in the cold of winter. 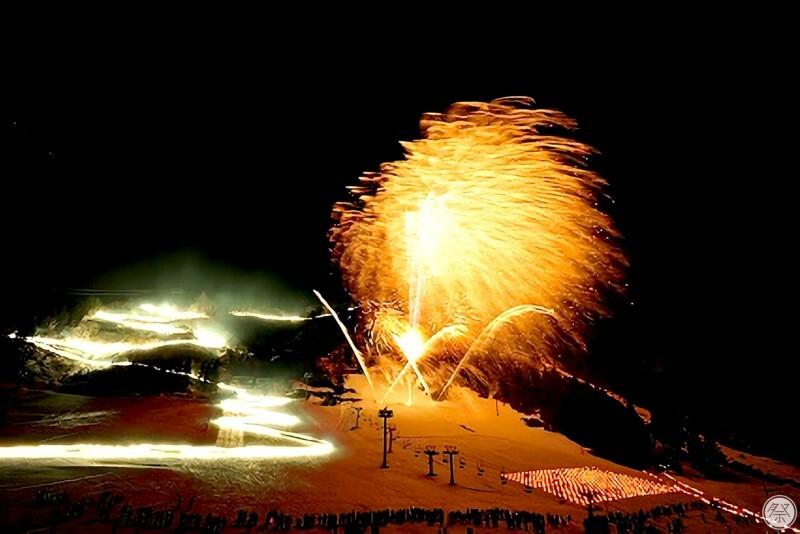 It offers chances for visitors to participate (reservation needed) with attractive events like the Torch Descent where skiers cruise down the slope in line holding torches and a snow mikoshi (portable shrine) parade on the slope as well. The Yuzawa Kogen area including the Nunoba ski slope in which the festival is help sits at an elevation of 1,000m above sea level. The festival venue is a short walk from the Echigo Yuzawa Station with easy access to the famous hot spring section of town. Enjoy a skiing and festival adventure all in one. 1．Carry the mikoshi in the snow! 2．Be dazzled by the flowing torch flames and fireworks! Or by calling the Tourism Association directly. Knowing a little bit of Japanese is strongly recommended for participation. As fireworks are held close by, there will be some sections closed off to the general public. Please refrain from entering. Echigo Yuzawa Station, JR Joetsu Shinkansen.